Designed for playing Baseball, Softball, Running, Golf, Skiing, Cycling and other sports. 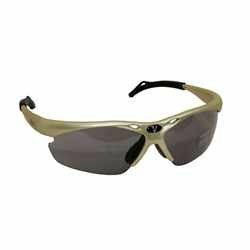 Vinci Multi-Sport Sunglasses come with three different types of lenses. The grey framed sunglasses come with smoked, red coated "mirrored," and orange lenses. Easy to change lenses come with very simple instructions. It's like getting three different pairs of glasses for the price of one, and you will always have the right lenses for the sun. Limited Time offer FREE black case holds glasses, lenses and cleaning cloth included * Rubber black ear tips for more ear comfort * Rubber nose pads are adjustable and help them from bouncing as you move * Total wrap around profile to give better field of vision * 100% UVA and UVB protection * Foldable-Lightweight * Impact resistant polycarbonate lenses are easy to change. If you have any questions about this product by VINCI, contact us by completing and submitting the form below. If you are looking for a specif part number, please include it with your message.